I found the article below particularly useful and interesting to read in "Deer and Deer Hunting" magazine. I have included the citation at the bottom if you are interested. Traditional archery has experienced a renaissance of late, with seasoned archers seeking an added challenge that turns even does into a big reward and others simply looking for a simpler bowhunting experience free of technological clutter. Companies such as the venerable Hoyt, Howatt/Martin and Bear Archery Products, and myriad custom makers, are selling traditional bows in numbers not witnessed since before the late 1970s "Compound Revolution." If you've caught the traditional bug, here are some pointers. Traditional bows gain 3 to 4 pounds per inch of draw and have no let-off. Draw weights are stated at a 28-inch IBO standard. When beginning, choose a bow pulling 45 to 50 pounds (even if you pull 70-pound compounds); a take-down model allows buying heavier limbs later if you wish to pull more. 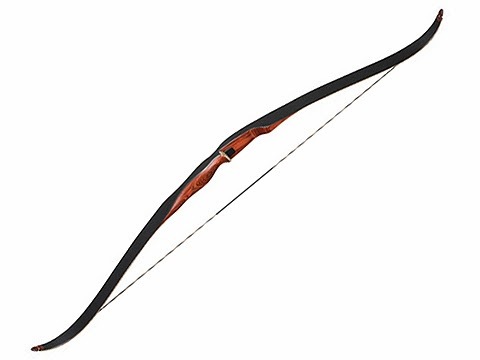 Buy a bow that fits your draw length. Lengths of 56 to 58 inches are ideal for draw lengths less than 28 inches, 60 inches for 28- to 29-inch draws, and 62- to 64-inch for those with 30-inch-plus draw lengths. This assures a shooting experience free of finger pinch and limbs working within maximum performance parameters. Less stored energy makes momentum most important to traditional performance, pointing to heavier arrows (10 to 12 gpi) with higher front of center (12 to 20 percent). Carbon arrows with .500 (with 125-to 150-grain heads) to .400 (with heads up to 250 grains) deflection are deadly traditional projectiles. Check out Carbon Express' Heritage (150 or 250), Easton's Axis Traditional (500 or 400), Alaska Bowhunting Supply's tapered Grizzly Stik Alaskan or Quest Products tapered Ironwood Lite. Shooting arrows directly off the shelf (across something like Bear Archery's Hair Rest) provides maximum point-ability while shooting instinctive and makes 5-inch feather fletchings a traditional standard. Choose heavier cut-on-contact broadheads--Steel Force, Zwickey or Simmon's Sharks are names to remember--which slip through hide and muscle more efficiently. Tuning traditional bows is just as important as tuning compounds. Much of this is accomplished by discovering the perfect arrow/point combination. Perfectly tuned traditional arrows display clean flight but also center where instincts naturally direct the shot. Trial-and-error fine-tuning is accomplished by manipulating the brace height (distance between handle and string, and changed by twisting or untwisting the string to vary overall length) and the nocking-point location (up/down serving, %-inch above zero a standard starting point). Both of these affect vertical and horizontal impact. Some fine-tuning also can be achieved by varying strike plate thickness (padding against the riser, typically leather). Start by bare-shaft tuning; shooting a featherless arrow--with enough duct tape applied to the rear to compensate for missing fletching weight--into a backstop from 10 feet away and noting the arrow attitude. Nocks pointing away from the riser indicate an arrow that's not stiff enough (underspined), a point that's too heavy or a strike plate that's too thick. Nocks cocked into the riser show an arrow that's too stiff (overspined), point that's too light or strike plate that's too thin. Upward-pointing nocks show the nocking point's too high; downward the opposite. Traditional bows involve shooting with your fingers. Split-finger shooting's (index finger over, middle and ring fingers under the nock) is the best for true instructive shooting with lower anchor points (corner of mouth or jawline); Apache (three fingers under the nock) is best for gap shooting (using arrow tip as aiming reference) while anchoring higher (cheek bone or just below eye). Grip the bowstring like you carry a bucket of paint, hooking fingers around the serving (bucket handle) while letting the remainder of the hand relax while drawing and anchoring. Traditional and compound draw lengths should remain equal. At full draw, "push" the riser away with your shooting arm, holding the string at full draw using back muscles (back tension). Canting the bow opens the sight window, letting you get your eyes directly over the arrow for more positive instinctive shooting. This also provides more comfortable grip. Aim small, miss small. Picking a finite small spot or visually creating one mentally while aiming is much more important in traditional shooting, as it gives you something to concentrate on. Follow through. Traditional bows are slower than compounds, meaning any movement of the bow arm during release has more potential to negatively affect arrow impact. Traditional bows take nothing away from compounds. They're just another facet of our sport. Meitin, Patrick. "Trying traditional: tips on choosing and shooting a traditional bow." Deer & Deer Hunting Mar. 2014: 71.